This review first appeared on my original Blogspot site on 1-6-17. Manoa Chocolate is a bean to bar chocolate maker located in Kailua Honolulu County, Hawaii. 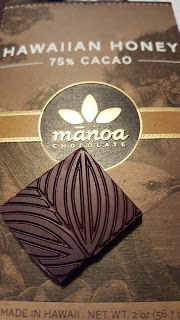 Hawaii is the only U.S. state with the right climate for growing cacao, however, Manoa does have to source some of their cocoa beans from other countries due to limited growing supply currently in Hawaii. 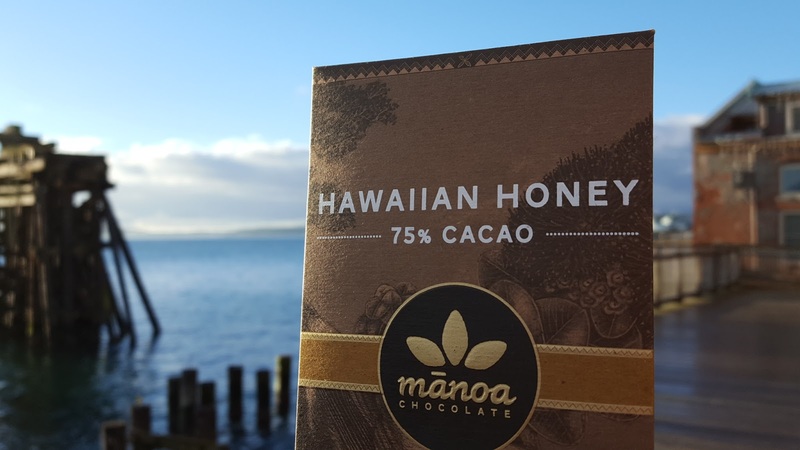 The honey in this Hawaiian Honey dark chocolate bar is sourced from the six largest Hawaiian Islands. Nose: Cocoa nibs, cafe mocha, vanilla. Texture: Smooth. Starts off with a medium-bodied mouth feel, but soon switches to a light, almost mousse like texture as it melts. Taste: Floral, cacao nibs, oak, and a shot of espresso with a twist of citrus peel. Finish: Acidity builds at the end, with citrus notes at the finish. I picked this bar up at the NW Chocolate Festival in Seattle, WA. Have you tried any bars by Manoa?